The mockery of pop stars who write songs about how tough their lives are is as routinised as any of the tour grind they complain about: a reliable cue to take a celebrity down a peg. 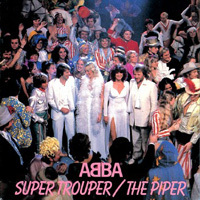 “Super Trouper” seems to have escaped this, maybe because ridicule was diverted to its silly, awkward title – or maybe because its exhausted candour rings too true. “Wishing every show was the last show”; “bored of a success that never ends”; “how can anyone be so lonely?” – as sung here these aren’t just the decadent complaints of over-indulged divas, they’re the sound of a miserable woman who’s stuck on a golden treadmill and wants off. Several years ago I did a thing on Freaky Trigger called “Thousand“: this involved playing through the 1,000 MP3s I’d collected at that point – a very small number it seems now – and writing about them in real time: one play per song, one draft, hit publish, that’s it. It was a notebook more than anything else and not especially worth revisiting – since my blog didn’t even have comments at the time I don’t know what I was trying to achieve! I liked the idea of that kind of on-the-hoof writing though and have looked for another opportunity to do it with a little more point and structure. The Pitchfork 500 seems like a good one: it’s a book laying out a history of pop from 1977 by way of 500 songs chosen by the editors. They’ve made every effort to make the book more than just a list – it’s implicitly also a story (of how music developed) and a statement (of what matters in music) and a musical experience (it’s sequenced as a playlist). It’s ambitious and thoughtful and if it’s wrong sometimes it deserves the honour of people working out why it is. So I think you should buy it. I also wrote a dozen of its 500 entries, so I’m not completely neutral here, but I have no inside knowledge about how the book was put together. This series of posts – which will be intermittent, as I don’t often have uninterrupted two-hour writing/listening chunks – is simply me listening to the 500 songs, in order, and jotting down what I think. I’m also reading along, and sometimes that’s informing the notes I make. Where I’ve nothing to say about a song I will indicate that I’m skipping it. Which Number Ones Of 1996 Would You Give 6 Or More To? GEORGE MICHAEL - "Jesus To A Child"
TAKE THAT - "How Deep Is Your Love"
GINA G - "Ooh Aah Just A Little Bit"
BADDIEL AND SKINNER AND THE LIGHTNING SEEDS - "Three Lions"
FUGEES - "Killing Me Softly"
GARY BARLOW - "Forever Love"
FUGEES - "Ready Or Not"
DEEP BLUE SOMETHING - "Breakfast At Tiffany's"
THE CHEMICAL BROTHERS - "Setting Sun"
THE SPICE GIRLS - "Say You'll Be There"
ROBSON AND JEROME - "What Becomes Of The Broken Hearted" et al. PETER ANDRE - "I Feel You"
BOYZONE - "A Different Beat"
DUNBLANE - "Knockin On Heavens Door" / "Throw These Guns Away"
SPICE GIRLS - "2 Become 1"